Concord-Carlisle’s Robert Doherty (left) and Lincoln-Sudbury’s John Herlihy met up on the field during the inaugural Harlem Lacrosse game at Tech Bostom. On a beautiful afternoon in early May, the new athletic fields outside of Dorchester’s Tech Boston Academy became animated by the presence of middle school athletes from three powerhouse lacrosse towns and 135 students from Boston middle schools. They worked in tandem during clinics and mixed scrimmages put on by the Boston chapter of Harlem Lacrosse, a nonprofit organization that aims to use lacrosse as a learning tool to inspire at-risk youth. And for students such as Tech Boston eighth-grader Corneilia Davis, lacrosse has opened a world of possibilities. Next fall, Davis will begin her first year at Cushing Academy, a private boarding and preparatory school in Ashburnham, thanks in part to the efforts of Harlem Lacrosse throughout the admissions process. While lacrosse is a key component of the organization’s mission statement, Harlem Lacrosse maintains a strong academic presence in its three Boston member schools: Tech Boston, Mildred Avenue, and Young Achievers. Each school is associated with a partner town, as Concord-Carlisle links with Tech Boston, Lincoln-Sudbury with Mildred Avenue, and Hingham with Young Achievers. A program director is assigned to each school and regional director Adrian Heneveld oversees the Boston chapter. Residents from the partner towns also offer volunteer tutoring twice a week and families often host students from their partner schools. Founded in New York in 2011 by Concord-Carlisle alum Simon Cataldo, Harlem Lacrosse has chapters in five cities and operated with a budget of approximately $4.5 million this past year, thanks primarily to donations. At Cataldo’s behest, Concord residents Maureen Dibble and Louis Salemy spearheaded the establishment of a Boston branch, which has grown rapidly since its formation in 2016. Lincoln-Sudbury coach Brian Vona, a member of the Boston advisory board alongside Salemy and board chair Dibble, came up with the idea for an annual event to raise funds for the organization. So he arranged for his Warriors to play Dual County League rival Concord-Carlisle to conclude Saturday’s festivities. L-S won the game, 11-3, setting the framework for what Vona and C-C coach Tom Dalicandro plan to make a tradition. Vona and Dalicandro, who were once lacrosse teammates at Newton North High, recalled how the game has already grown exponentially since only 20-25 programs existed in Massachusetts when they graduated in the 1980s. Over the past couple decades, they’ve coached two of the most successful high school programs in the state while watching the number of MIAA programs expand to 222, plus prep and private schools. The youth lacrosse leagues in Lincoln-Sudbury, Hingham, and Concord-Carlisle have been integral to the success of those programs, so Vona and Dalicandro hope that the connection between those recreational leagues and the middle schools in Boston will lead to success on and off the field for those students. ■ Three previously undefeated teams took their first losses last week. Melrose (11-1) fell to Wellesley and North Andover (9-1) lost to MVC rival Central Catholic in an 8-7 thriller Monday. Then Masconomet took down Hamilton-Wenham (8-1) Thursday, leaving top-ranked Hingham (12-0) as the only remaining unbeaten team in Eastern Mass. ■ BC High moved into a deadlock with Xaverian atop the Catholic Conference with a 10-6 road victory at the Hawks Nest on Thursday night. The Eagles have won seven straight games against Mass. competition since losing to Xaverian April 10 . . . Needham has won six straight since dropping three in a row . . . Wayland had its nine-game winning streak come to an end via an 11-5 defeat at Acton-Boxborough on Thursday. ■ In the Independent School League, St. Sebastian’s scored a key win over Rivers to move to 10-1 against conference competition. Governor’s Academy (7-0) remains the ISL leader with a huge showdown scheduled against Sebs on Saturday at 3 p.m. at Harvard Stadium. ■ Hugh Callahan, Wellesley — The junior attack led the way with five goals in a 9-5 win over previously undefeated Melrose Monday. 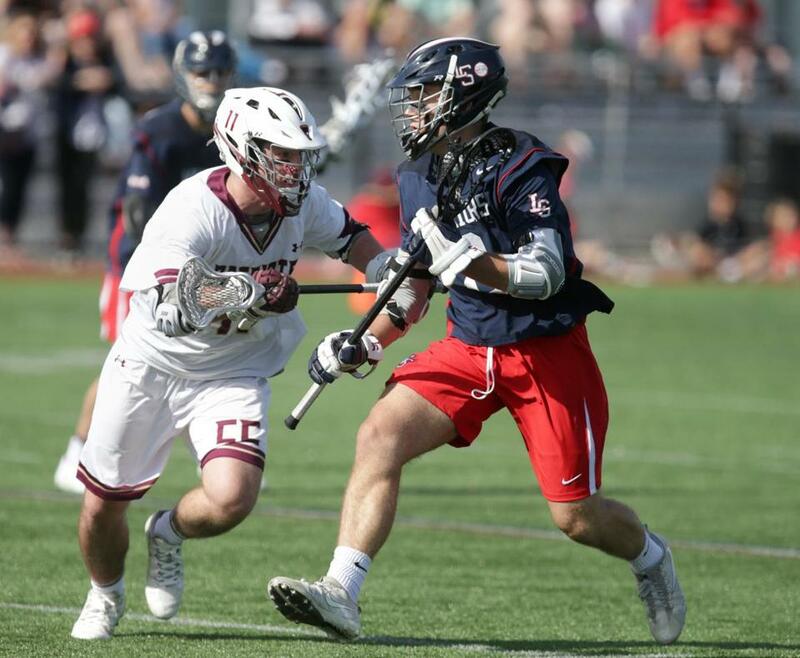 ■ Andy Calvert, Melrose — Not only did the sophomore middie produce three goals in a thrilling 11-10 win over Reading Friday, he proved invaluable with his work at the Faceoff X.
Eric Civetti, Franklin — The Panthers shocked Western Mass. power Longmeadow with 22 goals in a rout Sunday, and the Rutgers-bound senior led the way with a program record nine scores. ■ Pat Gillis, Ipswich — The senior netted four goals and handed out six assists in a 21-6 rout of Georgetown Saturday. ■ Johnny Kantaros, Rivers — While the junior long-stick middie only netted two goals for the Red Wings in Wednesday’s tilt with Tabor Academy, his tally in overtime was the difference in a 13-12 win. ■ Shawn Rice, Weymouth — The senior attack potted five goals in a 13-7 win over Framingham Tuesday, including the 100th tally of his career. ■ Tuesday, Melrose at Winchester, 4 p.m. — The young Sachems have been rolling, but the experienced Red Raiders will look to find some weaknesses in a key game at Knowlton Stadium. ■ Wednesday, Noble & Greenough at Belmont Hill, 3:30 p.m. — These schools are nipping at the heels of Governor’s Academy and are tied with St. Sebastian’s with a legitimate shot to take the ISL crown. ■ Friday, North Reading at Hamilton-Wenham, 5 p.m. — Two high-scoring teams meet in a Cape Ann League showdown. ■ Saturday, Lincoln-Sudbury at Duxbury, 11 a.m. — The Dragons host the three-time defending state champs and look to avenge last year’s blowout loss at L-S.
■ Saturday, St. Sebastian’s vs. Governor’s Academy, 3 p.m. — This meeting of two of the top-ranked teams in the region could go a long way toward breaking the logjam atop the ISL. Nate Weitzer can be reached at nweitzer@gmail.com.